Boathouse on the Bay Launches New Website | ASTRALCOM - Content Strategy, Conversion Marketing and Customer Acquisition. (Lakewood, CA – April 11, 2017) – ASTRALCOM, LLC today announced the launch of the new Boathouse on the Bay website. 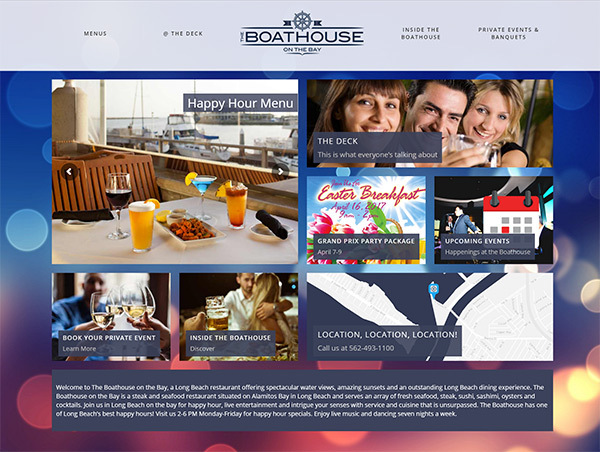 The Boathouse on the Bay restaurant is one of Long Beach’s premiere dining establishments and has been working with ASTRALCOM on its web presence and digital marketing efforts for several years. After months of planning, design and testing, the new Boathouse on the Bay website is now live at: www.boathouseonthebay.com. The new website is the second design for the Boathouse on the Bay and it builds on the success of the first design by ASTRALCOM. That design set a new standard in local restaurant websites because, at that time, the full-page image concept had not yet been used in local restaurant website designs. The new design goes in a completely different direction, again raising the bar in restaurant website designs. With a flexible design schema, the new Boathouse on the Bay website presents entirely differently on mobile devices than it does on desktop computers. “We know that a significant majority of Boathouse website visitors access the website via desktop computers and we didn’t want to sacrifice that rich experience with a typical responsive website design,” said Jewell Stoller Digital Creative Director at ASTRALCOM Integrated Media Services. Indeed the desktop experience is presented via a mosaic tile arrangement on the homepage and the mobile experience is done entirely differently and – in a more typical manner – suited for mobile devices. In both cases the new design helps direct visitors to each of the Boathouse’s unique offerings. The new design integrates “sticky” features that include multiple social media feeds, a robust calendar of events, visitor segmentation pathways, distinct calls-to-action and searchable menus. “When we review the Boathouse website analytics, we can determine important factors in visitor engagement that help us to create an improved visitor experience. That always translates to customers at the restaurant,” said Richard Bergér, VP of E-Business at ASTRALCOM Integrated Media Services. Restaurant and food service digital marketing solutions is an area of expertise for ASTRALCOM who’ve worked for other brands like Whole Foods, Fat Burger, Lucille’s BBQ Restaurants and Carl’s Jr.